After observing Martin Luther King, Jr. Day on Monday, the Legislature continued its work that included a Tuesday evening joint session between the House and the Senate to receive the Governor's budget address. As the Senate is the upper chamber of the legislature, it is traditional for the Senate President to preside over such joint sessions. 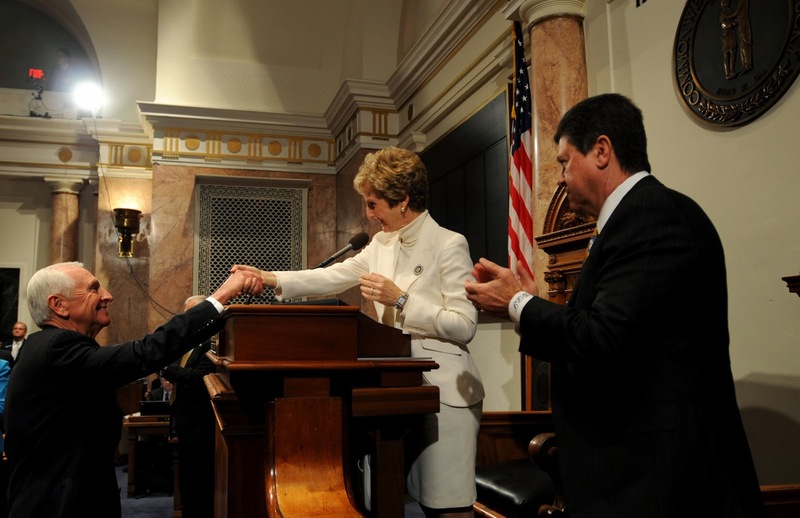 This time Senate President Robert Stivers vacated the podium to allow me to become the first female legislator, and the first Senate President Pro Tem, to preside over the joint session of the Kentucky General Assembly in which Governor Beshear presented his proposed budget. During the address, Governor Beshear presented a multi-faceted budget proposal of $20.3 billion dollars for the next two fiscal years. The plan calls for five percent cuts to most state agencies, proposes a gas tax increase, and borrows $1.9 billion in new debt. . Unfortunately, since the economy is stagnant we will have to make tough choices in this budget and operate within our means. Also this week several bills passed the Senate including Senate Bill 27 that moves all elections of constitutional officers to even-numbered years. This bill saves local and state governments millions of dollars by combining state and federal elections and will help engage more citizens in choosing constitutional officers with the higher voter turnout that normally occurs during Presidential election years. Senate Bill 4 is another cost saving measure and also passed the Senate this week without opposition. This legislation provides a onetime election for members to base their pensions on their legislative work only, rather than on a high salaried position such as a judgeship or executive appointment that they may pursue in their final years of service. Senate Bill 3 passed successfully as well. It is a measure that makes abundantly clear that the language in our state's informed consent law that requires a face-to-face consultation with a physician or designee prior to an abortion procedure must be done in person and not by pre-recorded message. Contrary to the current law, abortion clinics have adopted a one- size-fits-all approach to giving women required information prior to their having an abortion. Since no two people are identical and each woman may have different health concerns, they deserve to be provided individualized information before they can give truly informed consent to this life-altering surgery. Women should also have the opportunity to ask questions and receive accurate answers. SB3 makes clear that these consumer protection provisions are done in person and face-to-face. As the original sponsor of Kentucky's informed consent law, I support SB3 but am disappointed that such is necessary because abortionists have intentionally misinterpreted our current law and I believe are operating in violation of it. It is my hope that once women are given all the facts, they will choose life for their babies. I appreciate your comments and input. Please contact me through the Legislative Research Commission’s toll-free message line at 1-800-372-7181. Also, you can follow the work of the General Assembly at www.lrc.ky.gov.